Pollyanna England D'Arcy Sloan (March 18, 2018) | Burmeister-Johannsen Funeral Home, Inc.
Pollyanna England D’Arcy Sloan, the daughter of Glenn Alton and Nellie Grace (Holmes) England, was born on May 9, 1920, in Woodland, Michigan. 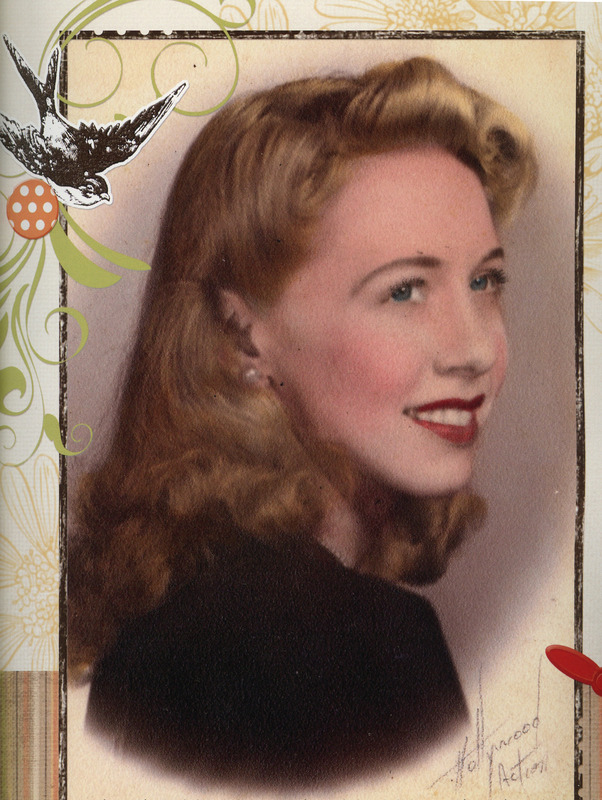 She graduated from Woodland High School in 1937, where she played basketball and excelled in music, piano, and singing. Pollyanna attended Business School in Detroit, Michigan. Then she moved to Chicago, Illinois, to live with her sister, Phyllis. She worked for Encyclopedia Britannica and sang with the Art Janke Band. On June 5, 1943, Pollyanna was married to George Edward D’Arcy in Chicago, Illinois. Three children were born to this union: Deborah (while Edward was stationed in the South Pacific), Douglas, and Daniel. After Edward’s honorable discharge from the Army in 1946, the family moved to Harlan where Pollyanna took on the traditional duties of mother and housewife. She returned to work in the early 1960s as a legal secretary for the Bill Lewis Law Office in Harlan, Iowa. Pollyanna continued to sing and play the piano; she played by ear and could play anything having heard it once. She sang at church, community chorus, and with many bands her whole life. Pollyanna loved traveling, tole painting, golfing, and cooking. She wrote and self-published a cookbook of family recipies. Pollyanna was married again in 1968, and lived mainly in the Rio Grande Valley in Texas. At the death of her second husband, she moved to be near her sons in Harlan, Iowa. Her retirement years were spent with her children and grandchildren, singing, and playing bridge. Pollyanna E. Sloan died on March 18, 2018, at the Salem Lutheran Home in Elk Horn, Iowa, having reached the age of 97 years, 10 months, and 9 days. Pollyanna was preceded in death by her parents, and her daughter, Deborah Hines. Survivors include her two sons, Douglas D’Arcy and his wife Janis, (Pash) D’Arcy, and Daniel D’Arcy and his wife, Mary (Fahn) D’Arcy, all of Harlan, Iowa; four grandchildren; five great-grandchildren; one great-great-grandchild; and other relatives and many friends. A memorial service will be held at a later date. Burial of ashes will be in the Harlan Cemetery, Harlan, Iowa. The Burmeister-Johannsen Funeral Home in Harlan, Iowa, was in charge of the arrangements. Condolences may be left online at www.burmeisterjohannsen.com. I had the pleasure of sharing wonderful visits with lovely Pollyanna. We shared the love of music, cats, baking, family, and faith. Her memory of some lyrics to songs she once sang was fun to hear. She was very appreciative and proud of her family. My husband and I send our thoughts and prayers to her family.